Dr. Heather Owen graduated from Oklahoma State University College of Veterinary Medicine, completed a rotating internship in small animal medicine and surgery in Loveland Colorado and went on to practice emergency and critical care medicine in Parker, Colorado. 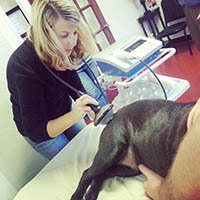 In 2005 she completed the medical approach to veterinary acupuncture through Colorado State University. She then started Animal Acupuncture, LLC in 2010 located in Tulsa, Oklahoma, which lead to her becoming certified in Canine rehabilitation, master trainer, fitness trainer, arthritis, and chronic pain management programs through the University of Tennessee. Her practice has evolved to include sports medicine, rehabilitation in addition to acupuncture for small animals. She is happily married to her husband, Dustin, and has 4 human children that are the loves of her life and 5 fur children, which complete their crazy life. Heather was the first and remains the only free standing rehabilitation and sports medicine facility in the state of Oklahoma and has mentored numerous veterinarians and veterinary students regarding integrative veterinary medicine.